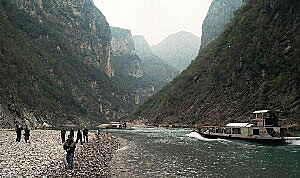 Before leaving home we had read much about China and the Yangtze. We were pretty much prepared for anything that we might come across. 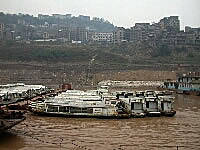 Most publications we read talked about how polluted the Yangtze River was and that anything could be found floating in the river. 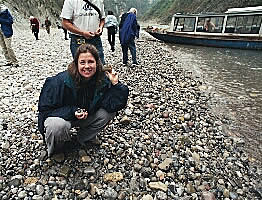 I can't speak to the water quality of course, but from what we saw there was very little floating debris in the Yangtze. I was pleasantly surprised by the lack of floating debris. I expected much more than what I saw. 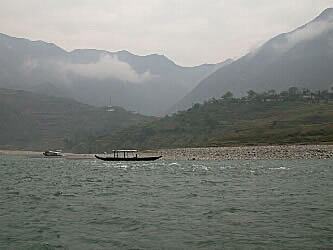 There is one thing you must get used to about the Yangtze, and that is its dark brown color. It definitely appears to be dirty water. 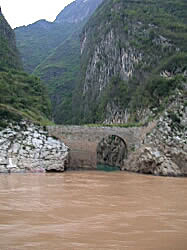 In the picture to the left you can see a small tributary feeding into the Yangtze and, just the other side of the bridge, you can see the beautiful emerald green color of the water. 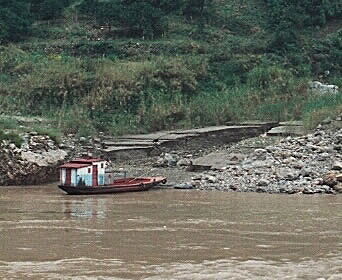 The Yangtze's brown color is, in fact, its life-giving force. 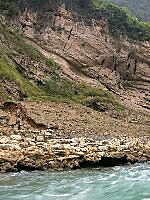 The silt that is being carried downstream from the mountains and valleys the river passes through. The amount of silk that accumulates on the river's edge is amazing. 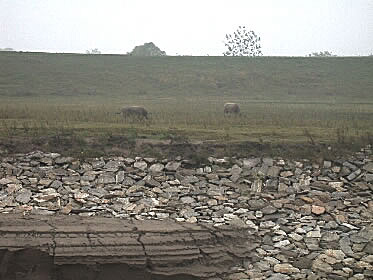 We saw silt deposits that were ten to twenty feet thick all along the river. After sunset (mind you, not that we ever saw the Sun actually set) we'd head off for dinner and then take a few turns around the deck. The weather wasn't cold and it was pleasant. 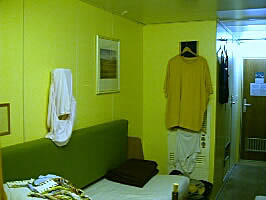 One night we walked past this cabin (photo right) to see a display of someone's drawers hanging from the room light and heater. This person was certainly comfortable sharing such a sight with us! I had to laugh. 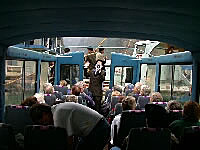 We were awakened early the next morning in preparation for our day excursion on a sampan up the Da Ning River to view what they call the Lesser Three Gorges. The scenery along this tributary of the Yangtze is spectacular and it's emerald green waters were beautiful, much different than the Yangtze's dark brown that we had become accustomed to. It was here, however, that I encountered my first disappointment of the trip. GCT's brochure had billed this as a ride on a sampan, which it was, but it isn't what I pictured. 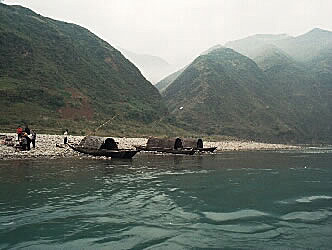 I pictured a small sampan capable of holding five or six people and powered by a man pushing a pole along the river bottom. 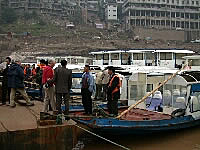 These were motorized sampans capable of carrying 30 to 40 people, and they weren't nice at all. They were old, decrepit and in need of repair, not to mention loud. But, I guess, it was the only way to really see these gorges. 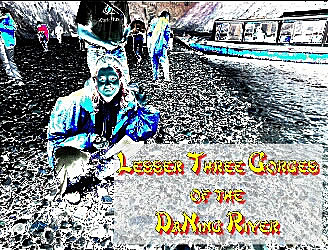 Had it been man-powered we would never have gone as far up the river as we did in the allotted amount of time. 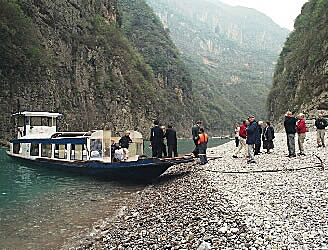 scenery that you are about to see along the Da Ning River will no longer exist. 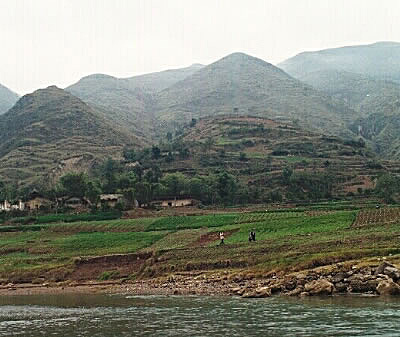 The picture (left) is a common scene along the Yangtze and the Da Ning rivers ... rich, fertile farmland covered with bright green patches where crops are planted. As you can see in this picture the crops are planted in small plots. We saw no evidence of large fields planted with the same crop as you would see on a farm here in the US. Why? I can only guess that it has to do with the fact that these farms are family farms cultivated by hand without the use of any machinery. The entire time we were in China I never saw a single tractor on any farm. I saw many people culling the land with plows pulled by water buffalo and many people working in the fields, but never with any mechanized assistance. We also saw many orchards growing oranges. They were beautiful with the oranges showing against the green of the trees and hills in the background. Unfortunately all of these farms that we saw will be flooded when the Three Gorges Dam Project is initially flooded next year. 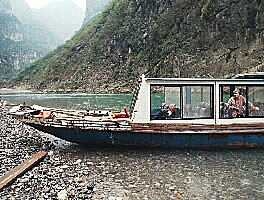 We traveled quite some distance up the Da Ning River passing beautiful green fields and through many beautiful gorges. Then, at the turnaround point, they ran our sampan aground on a rocky shore. There we all left the sampan to explore the beach in search of some beautiful weather-worn rocks. There were many in all shapes, sizes and beautiful colors. Everyone grabbed a handful including Anne and I. 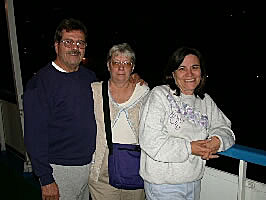 It's amazing the boat didn't sink from the added weight of the rocks that we picked up. When wet they were beautiful colors but dull when they dried off. Now I have to find a way to get them polished so they retain the beautiful coloration as if they were wet. I'd be willing to be we've brought a ton of sea shells and rocks home over the years, but never from the volcanos in Hawaii as it is believed that taking those rocks brings bad luck.